About a year ago, I said on this blog that I was giving up the hope of ever running a half marathon under two hours. And I was totally fine with it. Despite being a slow runner, I still enjoy the atmosphere, the camaraderie, around a run. I also enjoy the time I have only to myself to think about everything and anything during a run (0n this subject, I suggest you read a recent post from my friend sparrow in the tree top: the creative runner). But then recently I met someone who made me realize the importance of being healthy. I got a bit more serious about training and, most of the time, about food. As a result, I ran an official 10k in 52’35” a couple of weeks ago. And this morning I ran 10k under 50 minutes for the first time! 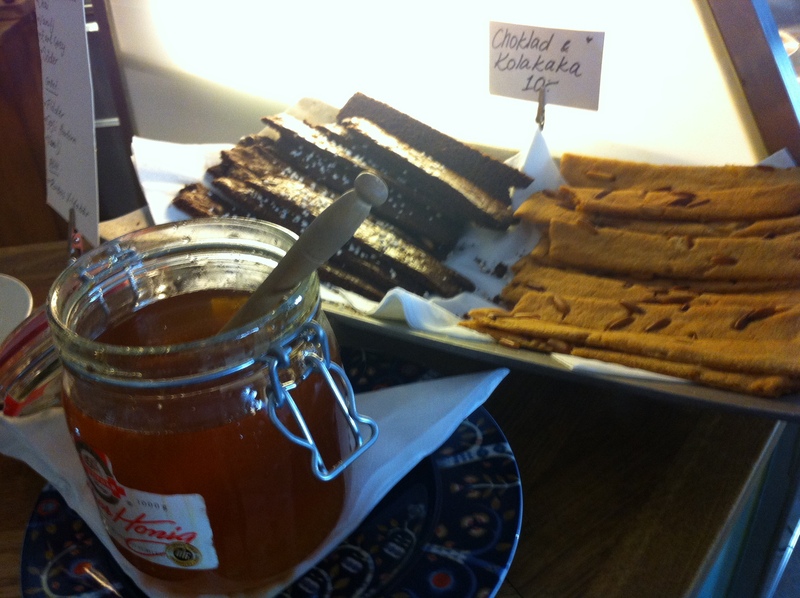 That’s how I ended up at Café Fresco this afternoon! Earlier this spring, a friend of mine took me to Fresco. 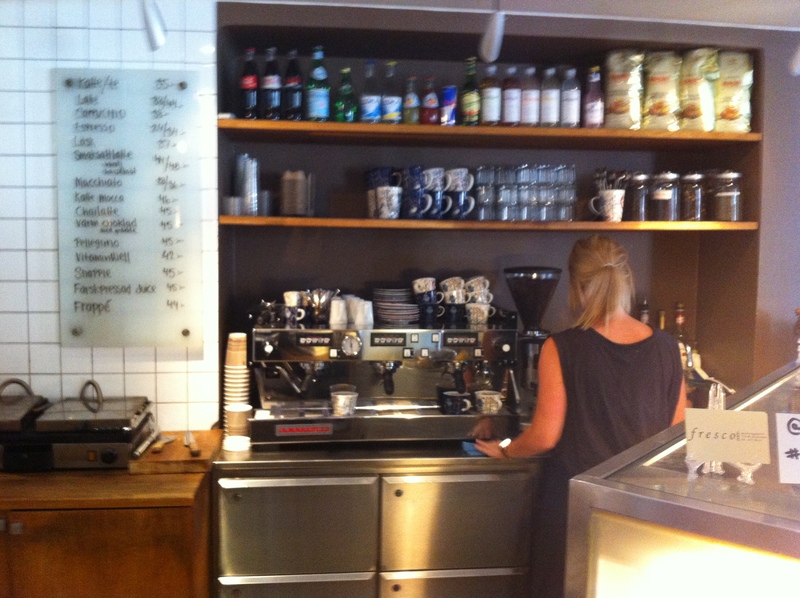 She lives in that posh area of town (Östermalm) and also knows the owner and/or the staff. It’s not like I need much convincing to visit a new café, but even at the time she told me that Fresco had the best – and the largest pieces of, carrot cake in town. Well, she was right. 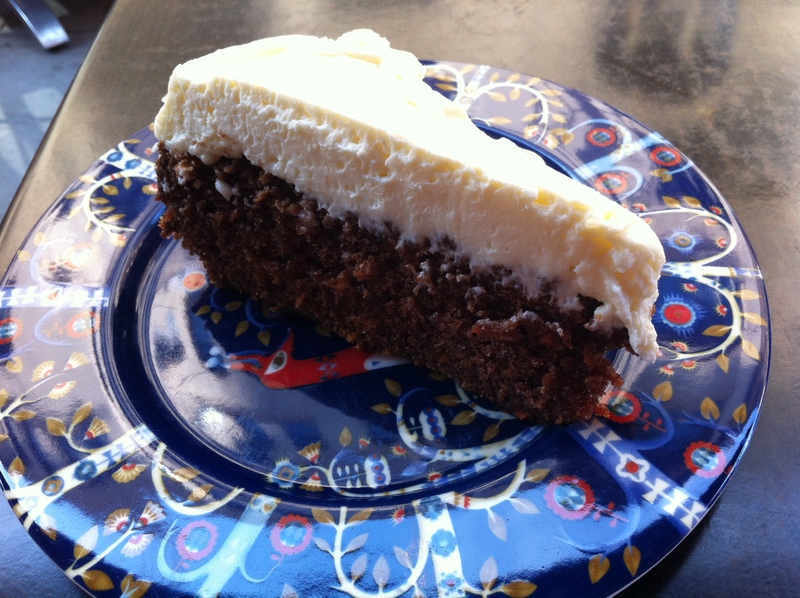 Carrot cakes are fairly common in Sweden. However, in most places the cake is served as a small square which is usually thinner than the icing only at Fresco! Don’t get me wrong. It’s not only because of the size! Although, I understand that sometimes size does matter, especially when it is a good cake! Fresco also serves nice coffee. 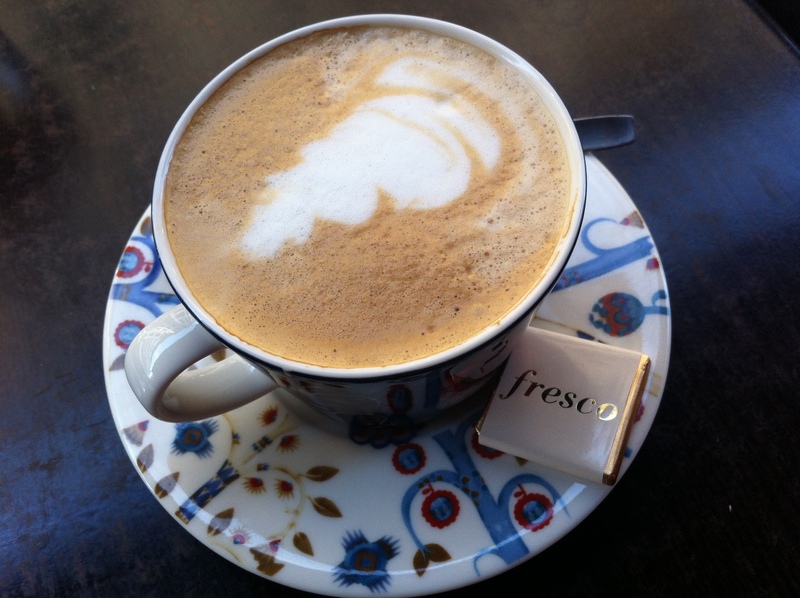 Today I had a cappuccino and I was pleasantly surprised to see that coffee at Fresco is served with a nice square of chocolate. The small details that make a difference. As I was sitting at Fresco, enjoying the carrot cake and the cappuccino, I had a quick exchange of emails with the girl for whom I decided to get healthy and managed to run 10k under 50 minutes (ok, forget the carrot cake for a minute!). It was interesting to realize that despite the challenges and frustration that come with distance, we both still enjoy those moments of loneliness. I believe that these moments of loneliness would be even better if distance was not part of our story, but the fact that we can still appreciate it is very positive. That’s probably why I like cafés so much. They allow us to be alone with other people, to see people without having to interact with them if we don’t feel like it. Café Fresco is a great place to see people and remain alone, especially in summer. 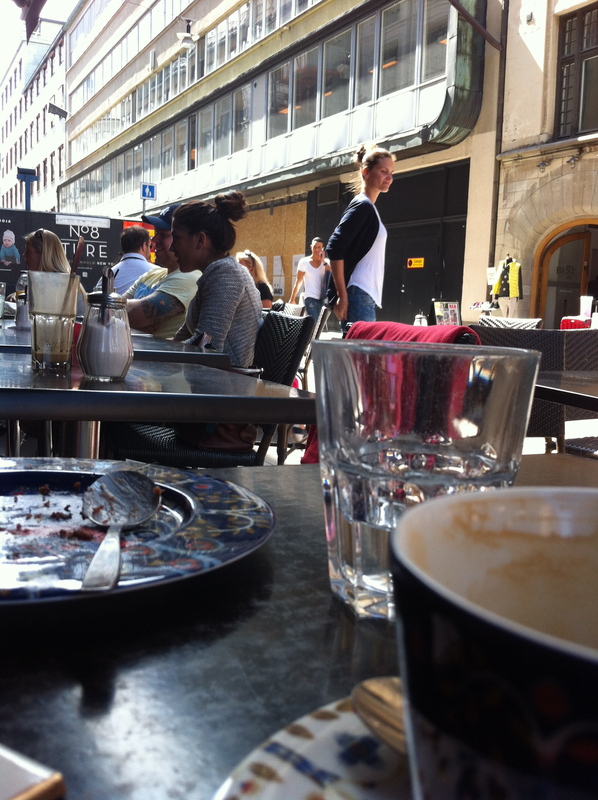 The place has a huge outdoor sitting area which gives on a pedestrian street of stockholm. Unfortunately, as of July 2013, there is some work being done on that street which, hopefully, will be done quickly. Café Fresco has a great location. Great food. Friendly staff. It is a bit far from home but this will certainly become a favourite in Östermalm. Next time I will try to avoid the carrot cake and have one of the sallads, which all looked delicious. That being said, if I return to Fresco on a running day, I might indulge and have a small piece of chocolate cake! I’m just doing some catching up!! FIRST of all – CONGRATS on that time!! Holy that’s an impressive benchmark to get to. Kudos to you – a lot of hard work goes into a time like that. I think it’s important to have that time (thanks for the link up!!) for all those reasons you mentioned – you know me, I love to be around people probably about 23 out of 24 hours of the day, but I do get what you mean when you say that you enjoy the “loneliness” of it – I also like how you equated it here to cafes which I think is so true too… it’s a good place to be with yourself, while you’re surrounded by people. I think that for me, that’s why I’d like to live in more of a downtown area again at some point – I like the idea that in a city there are people around you all the time. In a city when you look out your window at night, you’re alone but at the same time, you’re not. Congrats again on the time!! Thanks Emily! I’ll never be as fast as you are but I have to say, it really feels good when you start getting your PB down. The real test will come in September.